Born Sarah A. Graham, and reared in Ithaca, New York, "Aunt Becky" as she was to be nationally known, was about 17 years of age when the Civil War broke out. She had apparently married young, and had already lost her husband, a Mr. Palmer, for it was as Sarah Palmer that in June, 1862, she finally gained consent to be a regimental nurse, and joined the 109th New York Infantry, going first to Baltimore, then Bladensburg, then Deltaville with that unit which contained as many Ithaca men. As a young slip of a girl she was called "mother" by the men she nursed in the Army Camps and Hospital. This title she thought a little to much for one of her young years, and one day while objecting to that honor from one of the sick men in a hospital, a Doctor French of the hospital corps said he would settle it definitely and for all.... and dubbed her "Aunt Becky", a name which immediately stuck, and one which followed her throughout the rest of her life. She followed the northern Army throughout the remainder of the war, for three years, as close to the front as the hospitalization requirements allowed. In 1867 She married David C. Young, a contractor, presumably in Ithaca. In 1868 the couple removed to Des Moines, Iowa, where they and their family made their home ever since, until her death on April 6, 1908, the Anniversary date of her marriage, and that of the Battle of Shiloh. Her interest in the care and comfort of the military men did not die with the peace of 1865. When the Spanish American War broke out she helped to sponsor a chicken dinner while the men were still quartered at Camp McKinley at the Fairgrounds. With the $145, receipts taken from this affair she helped to organize the Iowa Sanitation Commission, this was in May of 1898. The functions of the Commission were similar to that of the present day Red Cross, the providing of bandages, and other accessories which the soldier might need in camp or hospital. Aunt Becky as might have expected, was the President of the organization. Aunt Becky wrote a biography of her war experiences which is in our Historical Library. I presume that other copies of the book are located elsewhere as well. Aunt Becky Young died in Des Moines, Iowa, April 6, 1908, at the family residence aged 76 years. Mrs. Young was a noted Army Nurse, Enlisted June, 1862, at Ithaca, New York. 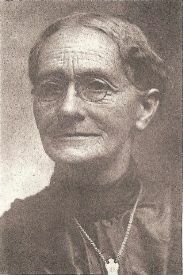 She was then Sarah J. Palmer. Her husband died before the war. In 1867 she became the wife of D. C. Young, coming to Des Moines in 1868, where she has since resided. Her Husband and two daughters, Mrs. J. S. Ainsworth and Mrs. Belle Belton, both of Des Moines survive her. "Aunt Becky" was a noble woman of more than ordinary fame as as army nurse, of unselfish character and devotion, giving her life to aide the union Soldiers; but in that very retiring and modest way concerning the deeds which have handed her name down to history. In one of her interviews she said: "Many a dying message was given to me for far away friends, many a last farewell was whispered in my ear for the dear wife and children." She was indeed the mother of all the soldiers, they revered her as much. Her pastor said of her; No soldier was braver than she, plying her holy work before the blaze of cannon; beneath the silent stars threading her way among the dead, seeking for the wounded with the light of love in her eyes and words of hope and cheer on her lips. "Almost every where she went, she was observed by some soldier whose life she saved or who had been cheered and nursed back to life and happiness by her, and many is the time that I have seen strong men clasping her hand in theirs, stand weeping before her, the noblest tribute, I imagine, that it was possible to pay to woman hood." It can truthfully be said of her: "None knew her but to thee but to love thee; None named thee but to praise". The dear ones of her household surrounded her in her last days and hours of her life, administering to every want and giving to her the most tender care. Tributes of respect and love expressed by choice words, beautiful flowers and a large concourse of friends marked the day of her burial; and loving hands laid her reverently to rest in Woodland Cemetery, that beautiful "City of the Dead" in Des Moines, her home for many years, where she was well known and honored by every citizen. The only "Aunt Becky" known to the history of our Country. She is buried in Woodland Cemetery in Des Moines, Iowa in Block 17 - Lot 134.